The basic rule of thumb is that HDL (high density lipoprotein) cholesterol is ‘good’ and LDL (low density lipoprotein) cholesterol is ‘bad.’ But according to Dr. Eric S. Rawson at the University of Massachusetts Medical School; “Cholesterol screening fails to identify 50% of the people who have heart attacks, because their total cholesterol is either normal or only moderately elevated.” So is cholesterol a friend or a foe? Of course nothing in life is ever that simple and if we had no cholesterol in our body we would be dead! Why? Because cholesterol is the base material (produced in the liver) that gets cleaved (methylated to be precise) by many dietary factors (B-vitamins etc) into all the hormones in our body (see the figure). 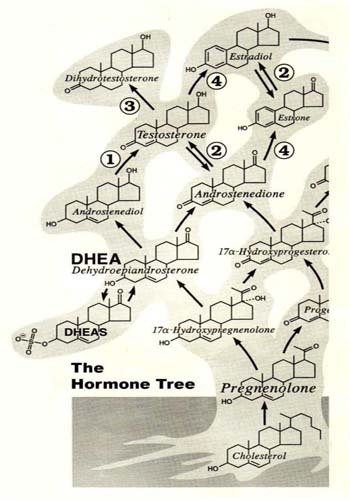 Figure: The hormone tree: Cholesterol is at the base of all hormones in the body converted first into pregnenolone. Whilst this figure just shows a few of the initial examples fundamentally it highlights that cholesterol is at the root of this hormone tree. Since the body cannot control its own intake of food and drink (and sunshine exposure), that’s our job. The only way it can enable itself to make more of a required hormone is to produce more cholesterol. According to Rich Lippman Ph.D., cholesterol can actually neutralize one of the nastiest free radicals that can be produced in our body- the superoxide radical- and Dr. Lippman knows a thing or two because he was nominated for the Nobel Prize in medicine for his work in measuring free radical activity within the body.